For the locals, the cemetery is not very popular. This is certainly not because of the place itself, but because the idea that a cemetery could be a tourist attraction is disconcerting. But this is to do the cemetery an injustice - the Cementiri de Montjuïc is a park that has a lot of art history and history to offer, and boasts some very beautiful areas. At the end of the 19th Century the city grew tremendously and the previously smaller cemeteries in the districts could not be extended. Therefore a new terrain was sought - the then little-used Montjuïc offered an ideal solution. 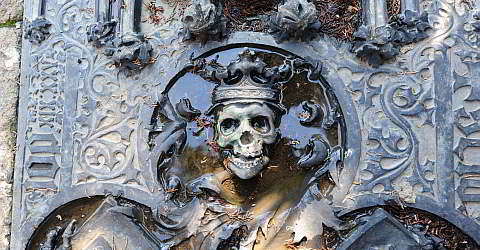 At the cemetery you can see the various ways in which remains are laid to rest in Spain: in a magnificent mausoleum – most of which in this cemetery are in the neo-Gothic-style, in a earth grave with ornate statues of saints, in family vaults or in the sepulchral niches, i.e. the coffins above ground in large communal graves. Up to eight graves are located here on top of each other. A commemorative plaque at the foot of the grave commemorates the deceased. Whoever was given such a resting place - magnificent mausoleum, niche or grave - surely depended mainly on how much the family members were willing to invest in the grave and its care. In particular the ground tombs and mausoleums are the special attractions of the cemetery. At the highest point of the cemetery you can see a crematorium of the Romans. Famous people who have found their final resting place at Cementiri de Montjuïc include: the musician and composer Isaac Albeniz, the architect Ildefons Cerdà, the President of the Generalitat Lluís Companys, who was murdered by the Francoists, the founder of FC Barcelona Joan Gamper and the renowned painter and sculptor Joan Miró. You can download a map of the Cemetery here (PDF file).